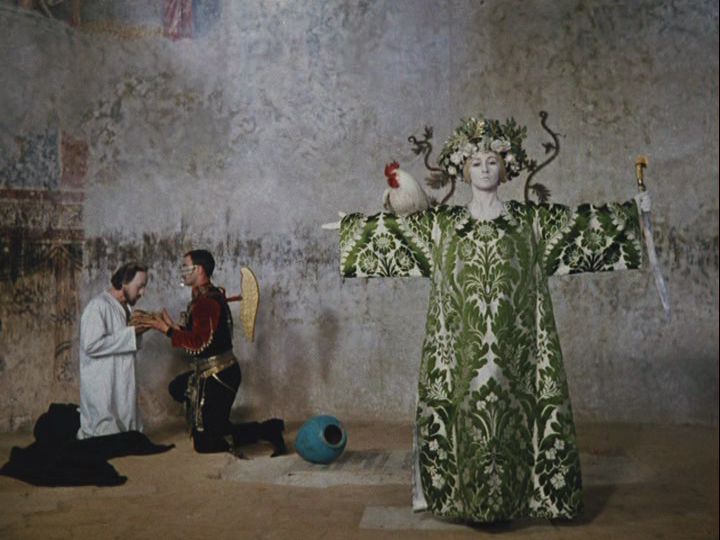 At the 2014 Cannes Film Festival, The Film Foundation/World Cinema Project premiered a new 4k digital restoration of Sergei Parajanov’s The Color of Pomegranates (1969). Currently it is screening at various film festivals around the world, and one hopes that it will see a Blu-ray/DVD release at some point in the future. I had the opportunity to view the restoration this summer at two different festivals: Il Cinema Ritrovato (Bologna) and the Golden Apricot International Film Festival (Yerevan). Accordingly, I would like to offer some thoughts on the significance of the restoration and the results. As I discuss in my 2013 book, The Cinema of Sergei Parajanov, the film survives in two distinct versions. The original 1969 theatrical release in Armenia ran at 77 minutes under the title Nran guyne (loosely, “The Color of Pomegranates”) and had Armenian-language credits and intertitles. The other version, intended for Soviet-wide and later international distribution, was reedited by the filmmaker Sergei Yutkevich and runs at 73 minutes, with Russian-language credits and intertitles. (The Russian-language title is Tsvet granata, which also translates loosely as “The Color of Pomegranates.”) The Film Foundation/World Cinema Project wisely has preserved and restored both versions, though the Armenian version is the one currently being distributed for exhibition via DCP. The Armenian release version is of particular value because it has been screened much less than the Yutkevich cut. More importantly, its editing is closer to Parajanov’s intentions. If we think of the film as a poem, the Armenian version better conveys Parajanov’s thought processes, especially his more playful and eccentric impulses. One sequence which I have always loved in particular is when the aging Sayat-Nova, now a monk at the Haghpat monastery, savors the beauty of spring. He embraces a young lamb then removes his robe to bask under the sun, and the other monks follow suit. During this sequence Parajanov builds on this basic underlying idea so that it achieves great emotional power. Yutkevich’s reedited version removes several striking shots and fundamentally changes Parajanov’s associative logic, ultimately robbing the sequence of some of its poignancy. However, even the Armenian version is not without its complexities and compromises. It was already the product of an extended censorship battle both with Goskino USSR in Moscow and the local authorities in Armenia. The most damaging change that the Armenian officials required was to remove almost all references to the poet Sayat-Nova, the main subject and inspiration for the film. In fact, the project was originally entitled Sayat-Nova, though admittedly it is common for film titles to change before release for various reasons, in the USSR, Hollywood and elsewhere. Parajanov is said to have liked the new title. How Sayat-Nova, the sacristan of Haghpat Monastery, found in the women’s monastery the very best shroud for the body of Ghazaros, and saw a nun who resembled the princess. Parajanov’s chapter title makes the main thrust of the episode clear to viewers, so that they can enjoy how this idea is developed visually during the episode. I asked for a shroud to wrap the dead body; instead, they showed the frenzied convulsions of their living bodies. Where can I find selfless love? In fact, Matevosyan’s title fits the underlying meaning and tone of the episode fairly well, as do most of his other chapter titles. They are often quite perceptive. The problem is that when combined with the film’s cryptic imagery and extensive use of pantomime, they make things unnecessarily difficult for the viewer. More difficult than Parajanov wanted, arguably. Although I do not have hard evidence for this, I suspect that the other main alteration in the Armenian version was the soundtrack. The film contains several extended silent passages–much more than Parajanov’s other films and, indeed, more than most modern sound feature films. In some cases it appears that Parajanov intended individual shots to be silent, as part of an overall dialectic of sound versus silence. However, some of the silences are very long indeed, and it is difficult to imagine that Parajanov wanted quite so much silence. My own (unsubstantiated) theory is that at least some of the silences indicate places where Sayat-Nova’s name was spoken on the soundtrack and were simply cut out at the last minute to appease the censors. The clearest example of this is at the end of the film, where the mason says “Sing!” (“Yerki!”) and “Die! (“Meri!”). If one looks at his lips closely, it appears that he originally said “Sayat-Nova, yerki” and “Sayat-Nova, meri,” which matches the dialogue in Parajanov’s script. As I note elsewhere, Alexei Romanov, the chair of Goskino, disliked the film and initially refused distribution outside of Armenia. Sergei Yutkevich resolved the impasse with Moscow by introducing new, simplified chapter titles that made the film easier to understand, and he even re-introduced some of Sayat-Nova’s poetry. He further trimmed a couple minutes of footage and rearranged some sequences. In fact some scholars I know actually prefer the Yutkevich version, because they have grown up with it and find it easier and more enjoyable to watch. I personally feel that the Armenian version is superior for a variety of reasons, but I do not consider the Yutkevich version to be a travesty by any means. I have shown it to students and in public on a number of occasions because the color and detail on prints for this version have always looked superior. This is because Yutkevich cut the camera negative to conform to his edit of the film, whereas the Armenian version only survives in a problematic duplicate negative. To sum up: the Armenian release version is not without its problems, though it does represent the original theatrical release version of the film. Thus, it is significant from a historical perspective. In terms of editing, it is far closer to Parajanov’s intentions than the Yutkevich version. Ultimately, I feel that it does a better job of conveying Parajanov’s creative vision. During Il Cinema Ritrovato, I had the opportunity to meet Cecilia Cenciarelli, the Archival and Restoration Manager for the World Cinema Project, and discuss some of the specifics behind the restoration. I will do my best to summarize some of her comments and observations below. As the Cinema Ritrovato program notes indicate, the restoration was conducted by the Cineteca di Bologna/L’Immagine Ritrova and the Film Foundation/World Cinema Project. It was derived from multiple picture and sound elements. The camera negative held at Gosfilmofond of Russia was scanned in 4k, as was the duplicate negative of the Armenian version held at National Cinema Centre of Armenia. For a color reference they used an early Orwocolor release print from the Harvard Film Archive. The important thing to keep in mind is that restorations such as this ideally adhere to commonly accepted standards and protocols in the archival community. One basic principle is that restorations should be philological—that is, any decisions should be based on a solid understanding of a film’s textual considerations (such as different versions) and surviving historical documentation around it–such as studio and censorship documents. A second principle is that any restoration work is reversible; in other words, the film should not be altered in such a way that work on it cannot be undone. A third principle is that any interventions should be documented. For digital restorations, as is the case with The Color of Pomegranates, this means partly that the work is saved and documented at each stage (raw 4k scan, digital removal of damage and dirt, color correction, etc.) so that one can retrace or undo each of these steps if necessary and do further work based on the same materials in the future. In my opinion, on the whole this restoration looks better than anything I have seen. In places I noticed colors and details in the film that I have not seen before. At the same time, the color timing fits within the general range of the various 35mm prints I have seen, but it benefits from greater evenness. The image is also stable and free of damage. I have long had concerns about the state of the surviving materials for the Armenian release version, based on the 35mm print I saw years ago and the poor quality video masters available in the US and France. Fortunately, this restoration was able to use the camera negative for most of the film, since there are only a couple minutes total difference in the footage between both versions. Because of the condition of the Armenian duplicate negative, it was not possible to make the footage from that element completely match the footage from the camera negative. In other words, the footage specific to the Armenian version looks slightly softer and has a slightly different color bias. Yet even that footage still looks better than what I have seen before. If anything, these visible differences are instructive from a historical perspective, because they show which shots Yutkevich cut and how the changes affected the film’s underlying poetic logic. The restored soundtrack also sounded stronger and cleaner than what I am used to hearing, including in the more problematic passages from the Armenian version. For me, this now makes the restored Armenian release version unquestionably the version of choice to view. For those who prefer the Yutkevich version for whatever reason, with any luck that restoration will also be released on Blu-ray or DVD alongside the Armenian version. My ideal Blu-ray edition would include both. Yesterday was my first experience with this film, actually was a special presentation at IFF (Festival Internacional de Cine de Panamá). I didn’t watched anything like that before. Looks that I started well, because was the 4k version. About the film, can’t say too much: Non-narrative. Can’t say if there is heroe road, like most of the movies. The colors, chorographies, makes up, clothes, faces are stunning. Every cut is really singular. So I come here researching because I really wants to know more about the film and the people behind this.